In late 1959, the Soviet Union initiated a program to select a group of cosmonauts for space flight. A special cosmonaut selection commission, established under the Scientific Research Institute of the Soviet Air Force (NIIVVS), was responsible for defining Soviet selection criteria that would meet the needs of the Vostok series of flights. Since the US astronauts had just begun their training program, the Soviets were able to evaluate the US selection standards prior to the start of their own program. The initial number of Soviet cosmonauts numbered 15. Of that group 11 carried out at least one space flight. Three of those veterans died or were killed in accidents. Some of the original group who never were selected for a flight probably were replaced in 1963 by military pilots who had to meet the higher selection standards that were imposed after Titov’s flight. In August 1961 Titov was the second man to orbit Earth. During launch and initial orbits Titov became extremely disoriented, could not differentiate between Earth and space and could not shake the feeling of being “upside down”. At some points during the flight he felt extreme fatigue, dizziness and nausea, and suffered from vertigo and headaches. Initially the Soviet selection criteria were similar to those of the United States in that Soviet officials selected only pilots in top physical condition who were believed to have the ability to function effectively in an isolated environment. Unlike the United States, the Soviets traded maturity, education, and flight experience for a younger, more athletic type of individual. The average age for the first group of cosmonauts selected was 28 years compared to 35 years for US astronauts. The Soviet candidates were selected largely from Soviet air force fighter squadron with varying hours of flight experience. None of the original cosmonauts were test pilots as frequently was the case with US astronauts. The Soviet selection program for the first group of cosmonauts generally consisted of three phases: (l) initial selection based largely on recommendation of others and documentation of family medical history; (2) a thorough medical examination; and (3) physical and psychological stress testing. The latter phase included tests on the centrifuge and vibration platforms along with simulated ascents in a low pressure or altitude chamber and tests for tolerance to decompression. 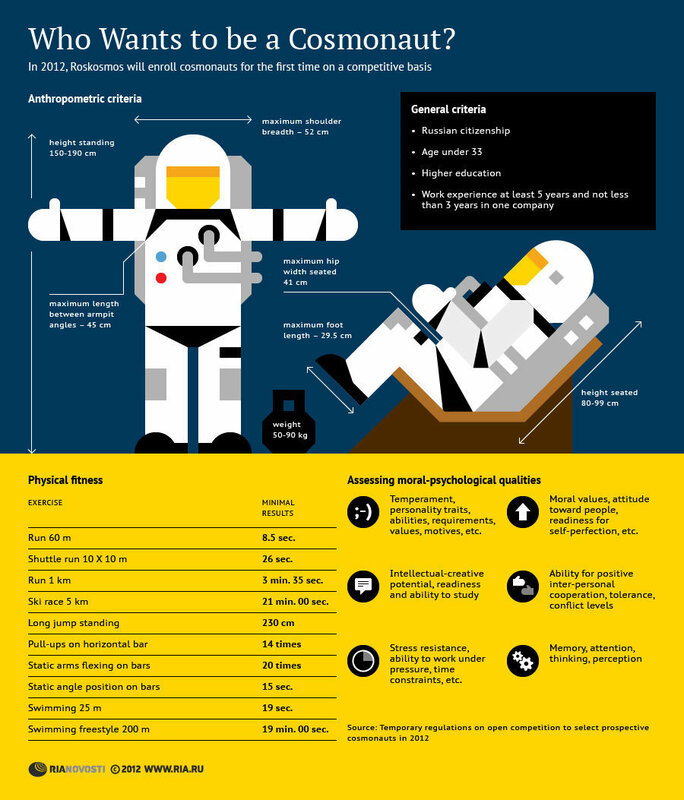 The cosmonaut candidate group then was subjected to a series of special exercises oriented toward improving physical conditioning and coordination, developing the cosmonaut’s ability to move in the weightless state, and augmenting his ability to withstand the various environmental stresses such us acceleration, high heat load, and hypoxia. Selection-out of personnel could be accomplished at any time if lack of physical capability or psychological incompatibility became apparent. Psychological testing measured: emotional stability (during a 2-week stay in an isolation chamber, suggestibility (from symptoms of imagined hypoxia following a mock ascent in a pressure chamber), operational memory (on continuous sequential tasks while subjected to interference), and the ability to react under stress (in selecting signal from noise under the pressure of limited time). A final selection of cosmonaut candidates was made early in 1960 nearly 1 year before the first Soviet manned space flight. Early in the program (after Titov’s 1961 flight). the selection procedures were modified significantly to include a battery of vestibular tests designed to eliminate the individual who was susceptible to vestibular disorientation during space flight. 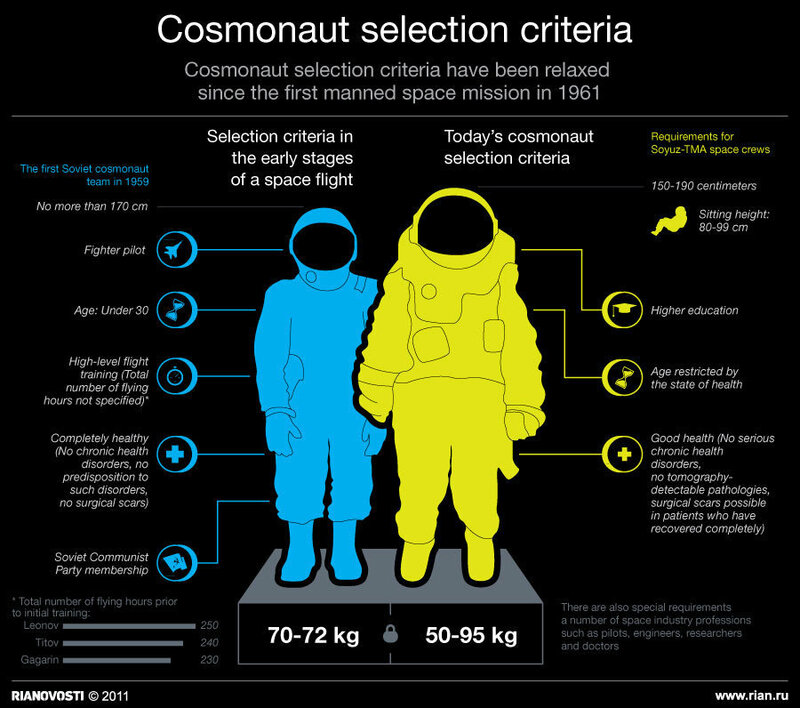 In the early seventies, the criteria for selecting cosmonaut candidates, although generally similar to those used for the selection of Soviet pilots, also incorporated several major changes from those used to select the initial cosmonauts. The changes largely reflect the operational requirements of more complex and longer duration missions. The most important change was the attempt to upgrade the technical background of cosmonaut candidates. The enlargement of the cosmonaut group after 1966 was necessitated by the need for additional cosmonauts for the Soyuz and Salyut programs and by the requirement for higher educational standards related to an expanded on-board program during Earth orbital space station missions. All cosmonauts recruited until 1970 were civilians. Almost all engineers with a background in aviation and spacecraft design and about two-thirds had advanced degrees. As of 1974, there were 75-80 cosmonauts of which 50 were military. The Soviets also adopted a more flexible attitude toward the once stringent physical requirements for selection of cosmonauts which were designed to test the cosmonaut’s abilities to withstand the physical and psychological demands of space flight. The Soviets openly admitted that they originally overdid the stress testing, and did not consider any longer necessary to prepare a cosmonaut for all extremes during flight. A psychomotor testing program was incorporated into the selection process including valid, objective measures to aid in the selection of cosmonaut candidates. The Soviets computerized the data in at least one psychomotor test which permitted nearly real-time readout of the test results of a rather sophisticated reaction time test in a simulated control system environment. This test involved tracking a dot which moved on a TV screen an identifiable pattern. A computer kept track of the errors in real-time and printed out the results. During selection and training, the cosmonaut was subjected to continual evaluation for what is often referred to as his psychological readiness to undertake a mission. This flight readiness state included his psychological compatibility with other potential crew members, an analysis of an individual’s personality, the kind of role he played in his interaction with others. familiarization with psychological reactions during flight, and his emotional stability in stressful situations. Lastly, he was subjected to so-called moral or political education in Communist ideology. Sometimes individuals did not live up to expectations. The main reason could have been an excessive emphasis on physical and psychological conditions while neglecting the skills necessary for their mission performance (e.g. piloting and technical skills). The selection process was carried out in several phases. The initial phase was the screening by a special commission of both civilian and military candidates based on personal history statements and recommendations of a candidate’s immediate superior and of Communist Party officials. The criteria for initial recruitment of the Soviet candidate differed somewhat from US practice in that the potential candidate ordinarily does not volunteer but is selected by his superior. During the second phase. the potential candidate was given a medical examination. the objective of which was to detect latent abnormalities. The functional capability of the whole body und individual systems. such as the cardiovascular, respiratory. and central nervous systems were investigated. Detailed examinations included neurological, otorhinolaryngological and ophthalmological along with X-ray and various biochemical and hematological tests. Physiological tests included those for gas exchange, external respiration. basal metabolism. and electrolytes. Electroencephalographs were evaluated and the vestibular function checked. If the candidate was found healthy, he was subjected to the final phase, consisting of stress tests. For example, tolerance to hypoxia in low-pressure chamber ascents. as well as by exposure to gas mixtures with reduced oxygen content. Centrifuge tests conducted to determine the individual’s tolerance to acceleration. In addition, a rigorous series of tests was given to examine vestibular stress tolerance. At that time only about 15-25% of those initially identified became cosmonaut candidates. About 50% were rejected in the initial phase, about 25-50% were eliminated during the medical examination, and another 10% were rejected during the first month of training probably largely because of failure to pass the stress tests.